Got my laptop in my bag, my notebook and a book about dialysis. 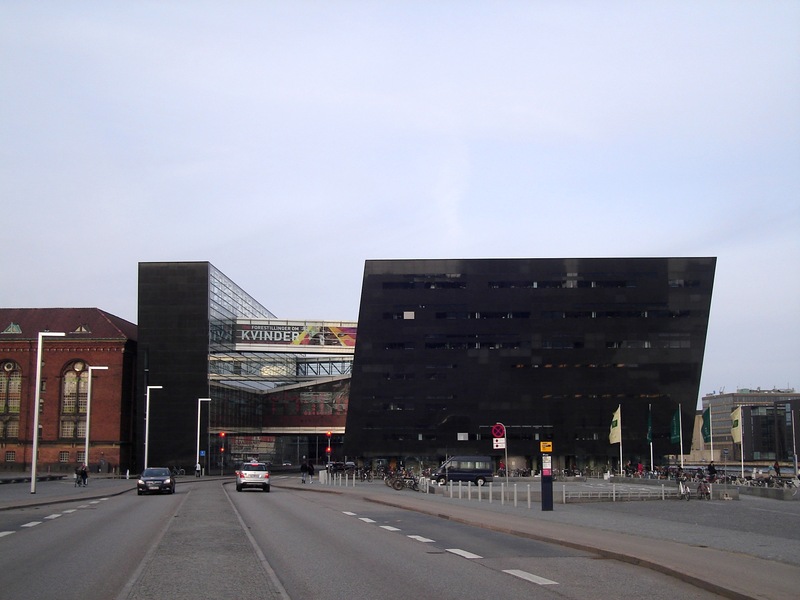 Get on my bike and I’m heading to the Royal Library, also known as Black Diamond! I got in the building and went straight to the reading room, double doors with a glass window… amazing! Looks like I just got into a movie! There are quite dark wood tables in the center, with green and golden lights in each table… Hanging in the high ceiling there are two huge round lights! And everybody seems so focused! I can “hear the silence” coming from this room that actually looks like one of those from a Harry Potter movie. Few minutes past 4pm and the reading room is half full… I’ve chosen a table, got myself settled and looked around… many young people, almost everyone has a chocolate bar or a cup of coffee next to them. This library was founded in 1648 by the King Frederik III, but was only opened to the public in 1793. And in 1999 they opened the extension of the library in a modern structure made of glass and polished black granite cladding, so the name given as Black Diamond! I have to turn on my laptop and decided to connect the headphones, hopping that wouldn’t make a sound… and it didn’t (awhhh!)! I’m finally ready to focus and enjoy this mystic atmosphere!